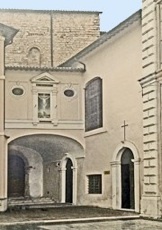 This oratory belonged to the Compagnia del Crocifisso, which was formed in 1570 and was affiliated in 1573 to the Confraternita del Santissimo Crocifisso of Rome. Its campanile (which is photographed here from the rear courtyard of the adjacent Palazzo Candiotti, and which has the campanile of San Domenico behind it) was built in 1754. The nucleus of the oratory, nearest the entrance, was built in 1587-1642. Its gilded wooden ceiling (1629-31) was the work of Francesco Costantini and Cristoforo Lacchi. The Crucifix, which is now on the high altar, belongs to the first phase of the construction of the oratory. This fresco, which depicts St Helena’s discovery of the True Cross, is inside the alcove on the left. The signature of Noël Quillerier and the date (1626) were discovered on the robe of St Helena during its restoration in 2013. The first extension towards the current high altar was effected in 1643, when the confraternity purchased the orchard behind their original structure from the friars of San Domenico. 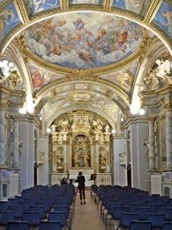 The attribution of this fresco on the ceiling to Giovanni Battista Michelini was recently confirmed by the discovery of the contract for it, written between the artist and the Compagnia del Crocifisso in 1666. 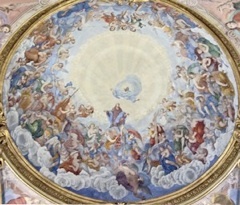 This fresco at the centre of the ceiling, like the six that surround it, is by Giovanni Battista Michelini. The final extension towards the current high altar was effected in 1702. 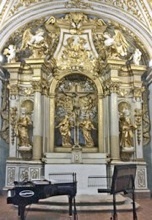 The altar (1706) was carved and gilded by Antonio Calcioni. 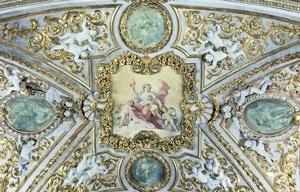 This fresco at the centre of the ceiling near the high altar and the four frescoes of other virtues that surround it are attributed to Carlo Lamparelli.